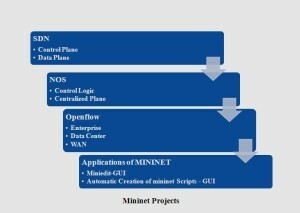 Mininet Projects referred as network emulator. We use mininet as software emulator for prototype a large single machine. It used to create virtual network running actual kernel, switching and software application on single machine. We apply mininet to make system as light weight virtualization like a computer network. We offer mininet academic projects for creation, interaction, customize and share software defined networking prototype in network topology simulation using open flow switches. We support mininet for research, development, learning, prototype, testing, debugging to ensure a complete experimental network on laptop (or) PC. Software defined network are implemented by us to reshape the designed network, managed and secured for M.Tech projects. We evolve open flow switches/ controllers such as NOX, open daylight and floodlight. It is a new architecture implemented in networking. Hardware switch composed of data plane and control plane components. We proposed various SDN process based on ACM papers. It has responsible to draw network topology and maintain track ability reach and neighbor status. Data plane composed of forward and routing table. It works faster than controlplane. Two planes are tightly coupled on device. In this network, we develop new application and change behavior of the device.Control logic is shifted from device to centralized plane which is overcome by SDN. Network operating system also referred as SDN in shifted control logic. We implement an open interface called Openflow to control the forwarded table in network switches, routers and access points. We can build network with new high level properties. Openflow enables wireless network with smooth handoffs, host mobility, secure default off network, new wide area networks and most energy efficient networks. New equipment is configured with automatic configuration. Common network environment such as NAC, PCI-DSS compliance are used. Cost effective solution are provided for ODMS. To address new requirement we use standard API.